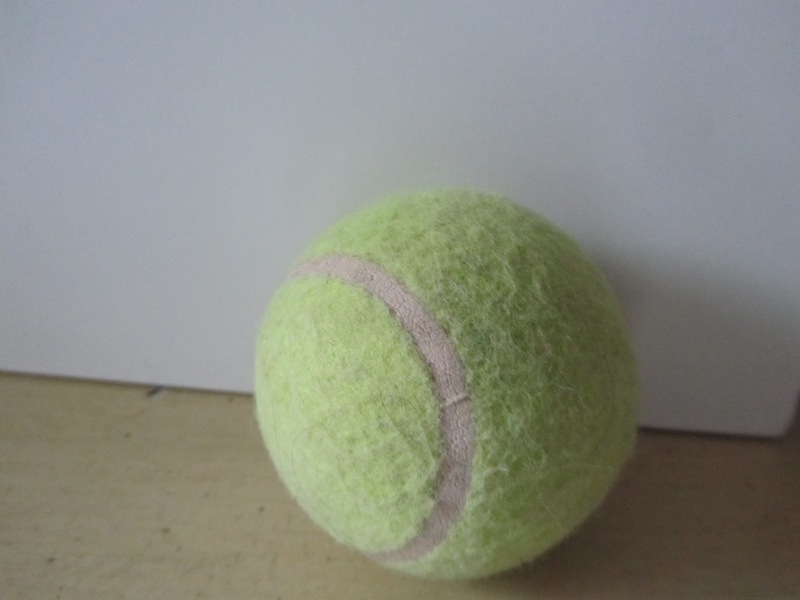 What does this tennis ball have to do with my poor aching back? I've had neck, back and shoulder pain off and on for several years. And in the last 5 months, I've developed a very serious condition. It's called "blogger's neck". Blogger's neck is what comes from hours spent hunched over the laptop keyboard. It's a pain in the neck, shoulder and upper back. 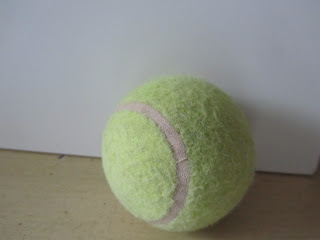 I use cold packs, ibuprophen and tennis balls to relieve my pain. Yes, I said tennis balls. Here's a trick I learned a while back. It's a way to give myself a back massage. For me, it helps to work out some of the kinks. Stand with your back up against a wall, heels about 2 inches from the wall. Drop a tennis ball down behind your shoulders, and "capture" it between your back and wall. Lean forward just a bit to move the ball down to the spot that feels tight. Now move your body around in circles to press the ball into the tight spot. You may want to do this where no one else can see you. My family is so used to seeing me try strange things, that they just walk right on past me, taking no notice of any strange movements on my part. I "massage" my back and shoulders for about 3-5 minutes like this when they're tight, and then I can get back to whatever I was doing. Another pain treatment I use, comes on advice of a friend who's a PT, cold packs -- those flexible-while-frozen packs to wrap around inflamed areas. Great for sprained ankles, twisted knees, and my shoulder. You can make your own cold pack with rubbing alcohol, water and a freezer ziploc bag. Mix alcohol and water in a 50/50 mix and pour into the ziploc bag. Don't fill the bag up. You want the bag to be limp and flexible when frozen. Freeze for a few hours. Obviously, this is one of those things that you have to do in advance of pain or injury-causing swelling. Otherwise you'll be waiting around for 3 hours till your cold pack is ready. But if you want to be prepared, or you have chronic pain, as I do, then you can make these up and keep in the freezer. When placing ice or a cold pack on the skin, always keep a layer of paper towel, or thin fabric between your skin and the pack. My friend, the PT, recommends an old, worn pillow case to put the cold pack in. The final thing that has helped me with this pain is doing my exercises. Doing the doctor-prescribed exercises not only helps to relieve the pain, but keeps me from re-injuring this same spot. Exercises for injury treatment are site specific and usually don't take that much time. My 5 exercises take me less than 15 minutes per day, and that's enough for me to receive benefit. Worth it to me. And, as always, this is not medical advice, but what has worked for me. It's important to see your doctor when you've injured yourself. You could do further damage by treating an injury in the wrong way. The most effective cure, of course, would be to turn off my computer for good. But where's the fun in that?! Have you found any unusual ways to treat aches and pains? Another good cold pack is the grain filled bags that are heated in the microwave to use as a heat pack. I made several a couple of years ago from field corn, and we keep one in the freezer for just the uses you're talking about. When we're done with it, we just put it back into the freezer for next time. I'm sure you've heard of others using a pack of frozen corn or peas for a cold pack. This is the same idea except you can use it forever. I'd heard of buckwheat and rice heat packs, but not cold packs. Good to know they can go in the freezer as well. I've been meaning to make myself a shoulder and neck wrap with fabric, and add lavender to the blend. When I just have stress in my neck that would be so soothing, but then I could also freeze it for inflammation. I use Live and Learn's trick too! Cold packs for ligament issues and hot for muscular issues I've got 'blogger's lower back pain' at the moment, so thanks for reminding me to do my exercises! I never would have believed that doing the exercises could result in such relief so quickly. Within about 5 days of starting the recommended set, I was standing straighter and could use my shoulder with more ease. I use the tennis ball for back massage also! When I have a knot in the muscle, I position the ball just over it & press against the wall gently at first and increase pressure as tolerated. It's like the pressure point massage I'd get at physical therapy. Thanks for the cold pack idea! I'm going to try that. I'm glad to hear the tennis ball massage works for you, too! The cold pack really does work. When I have pain, but don't want to take more ibuprophen, I use the cold pack and it definitely relieves the pain. Lili I’m going to give the tennis ball a try next time my shoulders tighten up. I have chronic lower back pain. I discovered an exercise that helps me quite by accident. I was walking in the park when I saw some litter on the other side of a split rail fence. I swung my leg over the fence to retrieve the garbage. It was quite a stre-e-e-e-tch. When I resumed my walk I realized my back was better. Thinking back I realized it hadn’t hurt since I climbed over the fence. The next time I was in pain I tried the same stretch and lo and behold I got relief again. that's great that you found a stretch for that spot. I found a stretch also by accident for my neck and shoulders. When you find that one thing that works, hang on to it. I always think to myself, "no one knows what makes my body hurt or feel better more than I do." The tennis ball is great for the kinks I get in my neck and shoulders. I can work just one spot and get relief within minutes. I hope it works for you, as well. I like the tennis ball idea, never thought of that one. I rarely have headaches, yes I know lucky I guess, but the couple of times I did when a teen my grandfather taught me this: roll up a bandana, tie it really tight around the head (picture the area where the bottom of a baseball cap would sit), and lie down for 30 minutes. It worked every time. I will try the bandana the next time I get a tension-type headache. Thanks for the idea! I'd much rather try something like that first. Yup, your PT friend is right on the money! I use the tennis ball trick a lot (any round object with a little "give" to it will work--I've used an apple when I've been desperate). The easiest cold pack is a bag of frozen peas. Just don't plan on eating them--but you can re-freeze them any time. FYI, the general recommendation is to use cold therapy for the first 24-48 hours after an injury (strained muscles from computer use counts). Most people gravitate toward heat, but initially the best bet is the RICE protocol (if it's an arm or leg injury)--Rest, Ice, Compression, and Elevation. If it's a back or neck, focus on Rest and Ice (cold packs). After about 48 hours you can use heat with great effect. (Cold reduces inflammation, which is what you initially want to treat ... heat increases blood flow which helps with healing once the inflammation has settled down). Ibuprofen is generally recommended over acetominophen (if you can tolerate it--it bothers some people's stomachs) as it also reduces inflammation. If you do any kind of repetitive activity (including computer usage! ), it's very important to get up and move around every 1/2 hour or so. Stretches are great. Prevention is key! I hope I'm being helpful (not annoying!) with these ideas. :) You can often treat muscle strain very effectively on your own if you know how. thanks for all your information. Helpful, indeed. I'll remember the apple, if I'm out and about (and not near my tennis ball). I try to remember to look up from the computer from time to time, as well. Not just for eye strain, but also for my neck. I do this at the kitchen counter when I'm working for a while, as well. Just that extra movement helps. Now these comments about using frozen peas reminds me of an episode of the Simpsons (I don't watch the show very much, really, honestly -- you don't believe me, oh well, your opinion of me has now sunk to it's lowest level! LOL) Anyways, it's a hot summer day, and Marge is preparing dinner, looking for the frozen peas. Homer is on the couch, sitting on the bag of peas, to cool off. Anybody else see that episode. It makes me laugh to think about it. Actually ... I love the Simpsons. My husband loves the Simpsons. So we all live at a very low level--but they're so darn funny! I don't remember that particular episode, but since I don't like peas, anyway, I think the best use of them is a cold pack! I like that idea about the ice packs, though to be honest I'm never sure when I should use heat versus cooling. I tend to use a heating pad on my back when an old injury flares up. I can't give medical advice, but I'll tell you what I know works for me. For myself, I use cold to relieve pain and inflammation immediately after injury or re-injury, and heat to relax the muscles and improve blood flow, like just before I do any stretching. I'm sorry to hear you have back pain. It can be so debilitating.